Hats and millinery is one of my passions so I'm very excited to share an interview from one of my sponsors- milliner Aimee Koch from Lady Eve Millinery on etsy. Millinery is an exquisite art form and Aimee was kind enough to share some photos of her process as she uses vintage techniques in every hat creation. What got you interested in millinery? I have always had a love of old things and history as well as a passion for creating things with my hands. I owe a deep debt of gratitude to my mother who taught me how to hand sew, knit and crochet starting at the age of 5. I did theater through school, college and continued on into community theater after that. This gave me a wonderful exposure to different costume collections. While at college, I earned a degree in History. I began picking up vintage pieces, including hats, and when they became more difficult to acquire, I started collecting vintage sewing patterns. My own vintage pieces becoming more often study pieces. I have had the remarkable good fortune to connect with clothing collectors and spend time examining their collections….one collection now belongs to a museum. I also undertook a study of vintage sewing and pattern drafting. At the same time, I've always been a great lover of hats and began first with sewing soft pieces from patterns. As the availability of vintage hats in wearable condition dwindled, I began exploring millinery shops in hopes of finding vintage inspired pieces. Doing that, I discovered that for truly vintage minded pieces, there didn't seem to be many options. At that point I rolled up my sleeves and determined to learn the craft for myself! I began a study of millinery techniques and piece by piece acquired a collection of vintage millinery blocks. 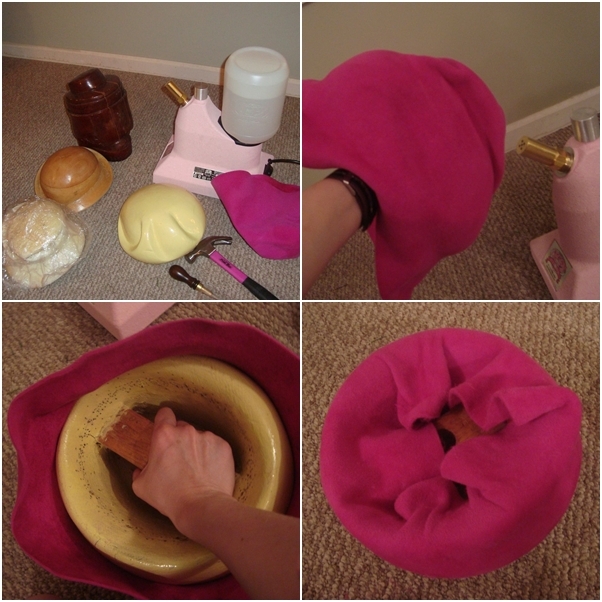 It's similar to sewing a new vintage dress from an old pattern…except I get to breathe new life into a vintage hat block. The result is a *new* vintage hat. I often dream about the fabulous vintage hats in films and old magazines. What is your favorite hat from film or old celebrity photos? Sometimes I will watch movies solely for the hat inspirations! Ask my husband. My earliest childhood days were pre-VCR/DVD…which meant watching old movies as they replayed on Sunday afternoons. My greatest hat loves are Ilsa's brimmed piece in the final scene of Casablanca (when she tearfully gazes up at Bogie); that green bonnet from Paris that Rhett brings to Scarlett to win a kiss; and Lauren Becall's beret in to Have or Have Not…which she tosses on the desk of the Vichy officer to read the label…..oh and that sweet little tilt hat in Girl Friday. I keep a running pinboard of my hat inspirations to draw from. You will see in my shop the "Ilsa" inspired by Casablanca and the "Olivia" 1940s style tilt hat series as well. My grandma said that she used to love to go to Macy's hat department as a girl and try on all sorts of hats. We're all saddened that hats aren't as popular today as they once were. 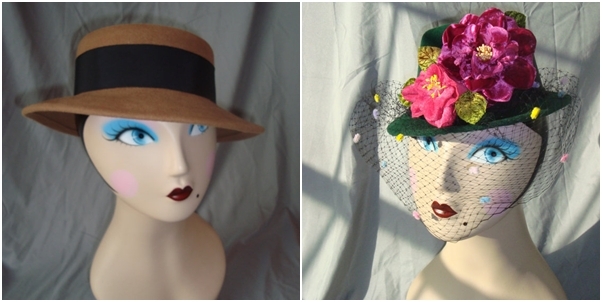 Do you have any tips for the modern woman who wants to incorporate a vintage style hat into her wardrobe? Do not be intimidated by hats! Isn't it funny that something that used to be considered a wardrobe essential now seems so intimidating to many? If hats are something you love, then express that and jump in. You will be surprised at how many lovely compliments you will receive. There is something so polished and ladylike about wearing a hat….don't be surprised if men start holding doors for you. I hear so often that women don't feel confident enough to step out in a hat…but wait until you try it! You will find your confidence boosted by admiring looks and comments. It makes wearing hats addictive I tell you! What's so lovely about hats is the range of options available. 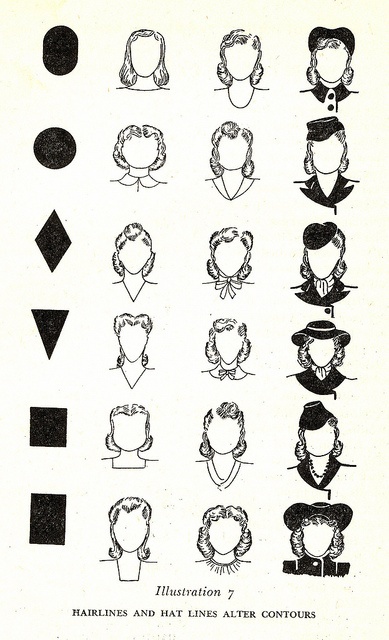 I'm including some charts on face shapes and hat silhouette pairs your readers might find helpful….evaluate what would be most flattering to you in terms of shape, but don't be limited by it. Consider your personal style. If you are a 50s loving gal, pass on the cloche and go with something like "Claire". 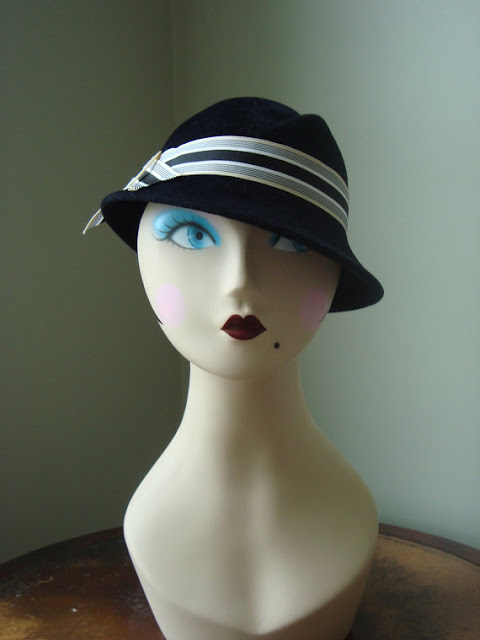 If you adore that 30s vibe, consider a brimmed piece like "Delysia". Once you have your hat, play with the placement on your head. 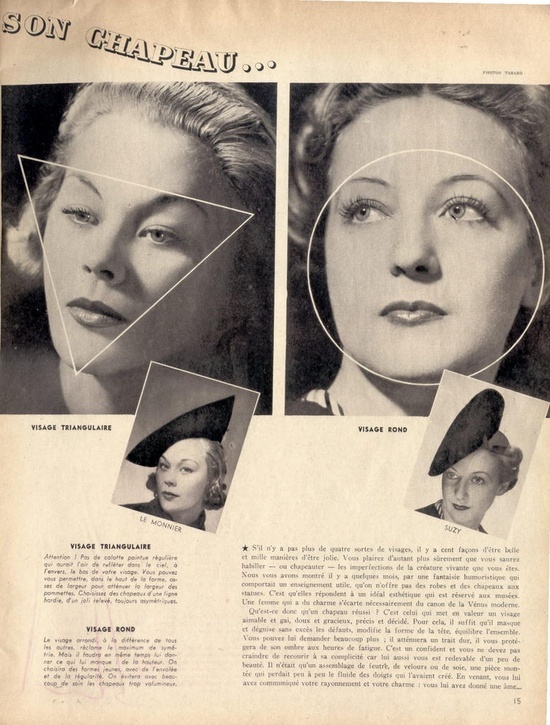 Simply tilting a hat to one side or another, can enhance your look…think of an eye half hidden by a jaunty angle as you gaze up at your own Bogie. If this is your first hat purchase, consider a neutral color and/or a simple trim before jumping into feathers and veils you might not feel bold enough yet to wear. Consider the quality of the hat. There is a large difference between a soft, lustrous fur felt velour and a mass produced wool felt. A hat is an investment piece and when properly treated, can give you years of wearing pleasure. It can be a signature piece of your wardrobe. Of the hats in my shop, I find "Delysia" to be a universally flattering daytime choice. There are so many possibilities for personal style with the tilt of that brim! The original 1930s block is in itself a work of art (there is a pic of the block with the listing). For evening, theater, dinner dates, and social events, I adore the "Olivia". It can be trimmed simply or with some extravagance. It is a *slightly* undersized 1940s tilt hat in the style of Girl Friday. What strikingly wonderful, timelessly beautiful hats. I adore vintage and repro toppers so very, very much, wearing them myself more days than not. It's a joy to read more about the millinery arts from an actual hat maker. Thanks for the terrific interview, Brittany and Aimee. You should feature Aimee in Hey Doll, Brittany :) Great interview! I love hats, I don't wear them as often as I'd like though! I have often wondered about making them too. Again! Thank you very much, Brittany! OOH! I love the Zelda! I'm currently high up in vintage Heaven. I sing in a choir where I am definitely the youngest, and that's putting it mildly. I came to talk with one of those sweet, little old ladies about the 1950s, and clothing of the era and.... Out of the blue, she told me that she still has the white dress her mother made for her when she graduated school at 18, and that it's just hanging in her wardrobe. So she said that if I felt it fit me, it was mine. She would bring it to the next choir practice so I could try it. Ladies! Shop announcement... I've added a coupon code which will entitle you lovely Vavoom readers to a 15 percent discount off your order! Good until the end of March!! You are such an inspiration! Loved the blog, i`ll be always visiting here. xo, honey!